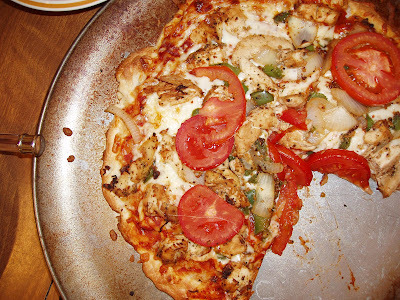 Yes, this homemade pizza was as delicious as it looks. Looks fabulous. I love love love homemade pizza! We make it on our pizza stone. One of our favorites is chicken alfredo. Another unique one we really like is salmon and spinach pizza. I know it sounds weird but if you like salmon it is so incredible! The only thing that frustrates me about my homemade pizza is the crust. I haven't really found a crust recipe that I love yet. Looks great!!! I am getting hungry just looking at it. I shouldn't have looked at this right before lunch!! Hi Hi! I got your foxylishious cards in the mail and here is what I have to say...Thank you Thank you Thank you! They are beautiful and I am giving one to Joel for our anny on Thursday! Hip hip hooray for pretty colors and gorgeous ribbons! !